While classic lines belie her high-tech construction technique, there’s no mistaking the Talaria 40’s pedigree. For those of you who don’t know it, Shep McKenney is responsible for Hinckley’s latest jet boat, the 40-foot Talaria. 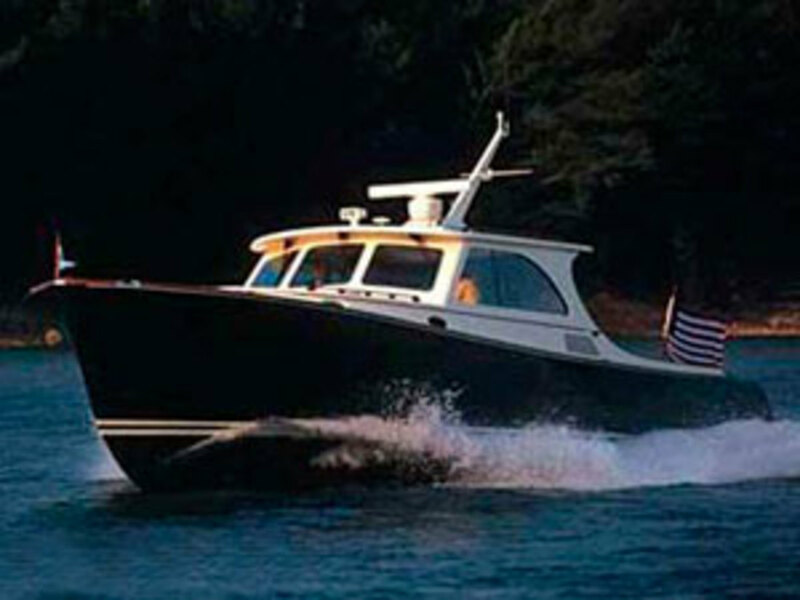 "I grew up around beautiful boats–Rybovich, Matthews, Huckins," the former (1982 to 1997) co-owner of the Southwest Harbor, Maine-based Hinckley Company tells me. "We lived in Virginia, and my grandfather had a 14-foot cypress skiff he’d take me out on." But it was the Lyman lapstrake runabout–with her batten-style ribs and varnished mahogany interior and transom contrasting with the sparkling white topsides and graceful, upswept bow–his father gave him that most probably planted the seed for the design. 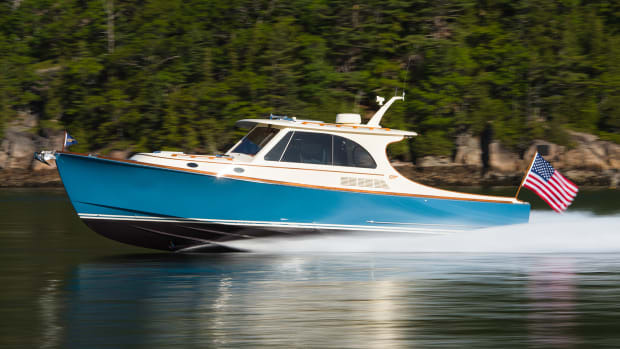 During histenure at Hinckley, McKenney and Haywood May, president of Bass Harbor Marine, the Hinckley-owned service yard, came up with the idea for a lobster-style runabout built on the lines of many of the Downeast workboats plying their trade in Southwest Harbor during the summer. "In particular we liked the low, sleek profile and even-running attitude of the boats," McKinney recalls. 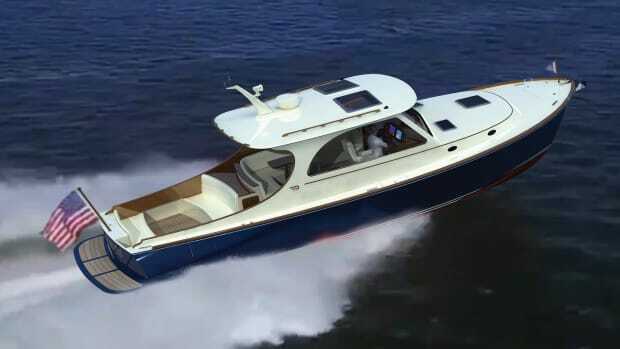 The two figured that if they applied the latest techniques in design and materials, the boat they built would be far superior to anything in her class, so they called in the well-known naval architect Bruce King to draw the 36-foot Picnic Boat. That boat, introduced in 1994, created a design phenomenon not seen since the hollowed-out log got its pointy end. The Talaria 40–so-named for the winged sandals worn on the ankles of the mythical figure of Mercury, a.k.a. Hermes–is the latest evolution of McKenney’s vision and joins the progenitor 36 and big sister 44. And while the beauty of her lines, fine joinerwork, and excellent fit and finish are evident, to me it is her construction techniques that make the 40 special, just like her siblings. Construction of the 40 begins with Hinckley’s patented DualGuard composite construction. The skin coat is chopped E-glass mat and low-shrink, vinylester resin, while the outer skin beneath the skin coat (hence the term DualGuard), where no mat is used, is DuPont Kevlar and E-glass. The core utilizes aircraft-grade balsa and high-density foam, and the inner skin is 100 percent T-700 carbon fiber. As with her sisterships, the resin is infused into this sandwich by SCRIMP. 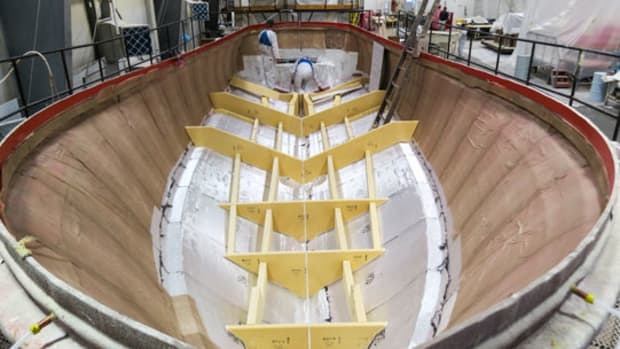 This proprietary vacuum-bagging system fully saturates the resin, virtually eliminates noxious emissions, creates a void-free structure, and according to Hinckley, results in a vessel 14 percent lighter than similar-size boats built with traditional FRP construction techniques. Eachportion of this composite construction has a specific purpose. The chopped E-glass, with its vinlyester resin, not only protects against osmosis but also creates an exceptional outer finish, something easily noticeable as I looked down the hull from stem to stern. The Kevlar and E-glass combination provides extra protection against impacts, such as those caused by errant docking maneuvers–highly unlikely due to Hinckley’s patented JetStick technology. More about that later. The balsa and foam core combination supplies stiffness and acoustic insulation, which is enhanced by SoundDown in the double-gasketed hatches, decking, and interior areas right up to the shaft. This was evident to me as I registered only 80 dB-A at WOT on my sound meter with the back curtain open (65 dB-A is the level of normal conversation). That’s far quieter than many open/express boats of her size and horsepower I’ve tested. Finally, the carbon fiber in the inner skin, with its excellent strength-to-weight ratio, supplies extra stiffness. While examiningthe areas housing the twin 420-hp Yanmars–a flip of a switch hydraulically raises the cockpit settees doubling as engine boxes–I noticed that the through-hulls fittings were Marelon ball valves and that every hose connection below the waterline was double-clamped. The space also afforded easy access to all critical engine maintenance areas. 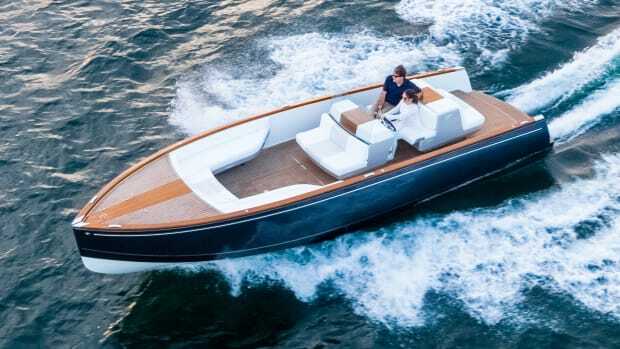 According to Eric Champlin, Hinckley’s South Florida sales manager (and who, according to his biography, has spent more time on Picnic Boats than anybody else in the company), the engine beds are laminates of carbon fiber, E-glass, and vinylester resin over a high-density core. The thickness of those laminates on the tops and sides measures some one-half inch. While her construction techniques are certainly important features, it is her flawless finish and fine lines that make the Talaria 40 impressive to look at. 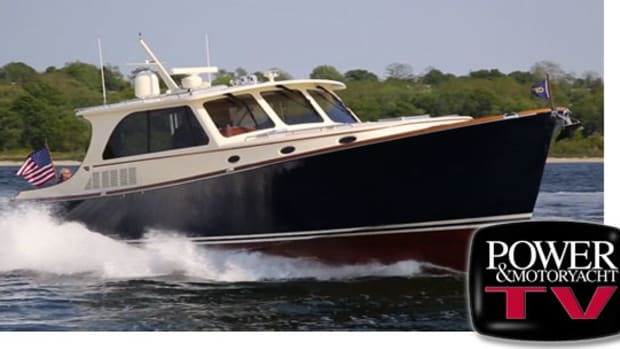 She has stately curves and a flared bow reminiscent of her lobster boat ancestry. Her sheer is refined, and the tumblehome is nothing less than dramatic. And her cabin tops are in perfect proportion. 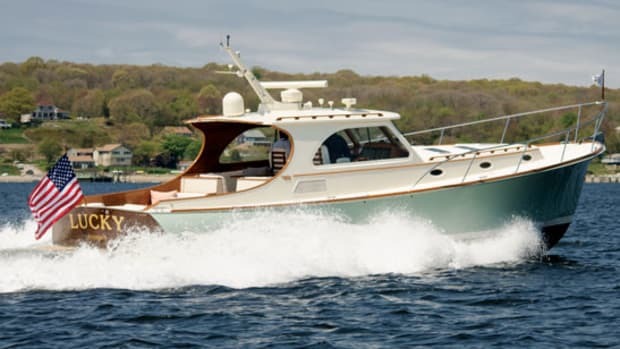 While her interior is small for her LOA, it is nonetheless still effective for her dayboat or long weekend purpose and, of course, reflects Hinckley quality. There’s 6&apos;1š4" of headroom here, and the overhead is cambered with satin-varnished cherry crossmembers contrasted against gleaming white. The brightly finished sole is of teak and tulipwood, and the forward V-berth, with slatted bulkheads, allows a comfortable if somewhat close space for two. Stowage is limited. There’s a small locker to either side and four cubbies in the bulkhead for small items. The compact galley to starboard has a space-saving refrigerator sunk in the countertop, stainless steel sink, and four-burner stovetop, while the head, with VacuFlush toilet and shower compartment, is to port. From hereit’s two steps up to the helm, where I found unobstructed 360-degree views courtesy of a three-piece windshield, two large side windows, and, of course, that open cockpit, whether I was sitting in the Stidd helm chair to starboard or the matching one to port. Aft there are settees to either side, the port one having a hi-lo table that converts it to a sleeper couch. There’s additional seating in the cockpit just abaft of the drop curtain, to either side on engine boxes that double as settees, and at the transom. The helm offers plenty of space for electronics and, to starboard, the patented JetStick. If you get weak in the knees maneuvering around the dock, this nifty gizmo will have you tapped into your inner skipper once you get the hang of it. A twist to port or starboard produces near-instantaneous side-to-side movement, while a push to either side activates the bow thruster while vectoring the flow of water through the jet buckets for surgically precise docking. There’s even a hover mode for standing still. I know, I tried it. I found the Talaria 40 to be an exciting boat to drive and noted a cruising speed of just under 30 knots. At that rate, with her 340-gallon fuel capacity and 34.9-gph burn, my test boat had a 263-NM range. When I cut her back to a more leisurely 22.4 knots, I calculated a 353-NM range while she sipped 19.4 gph. She handles like a sports car, turns on a dime, and accelerates without significant bow rise. Unfortunately my test day saw calm winds and an easy seaway, and therefore I could not ascertain her seakeeping abilities in deteriorated conditions. As far as tracking is concerned, by utilizing the fine-tuning setting on the JetStick control, I noticed little difficulty in keeping her straight and true. 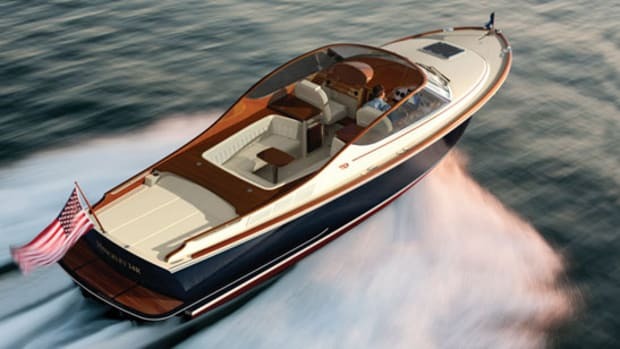 The Talaria 40 does not come cheap: $743,000 with a pair of 420-hp Yanmar diesel inboards coupled to Hamilton 322 waterjets for what basically is a day boat and, at best, a weekend cruiser. But you get what you pay for, and with Hinckley that includes all the quality and care that a semicustom builder can put into its product. 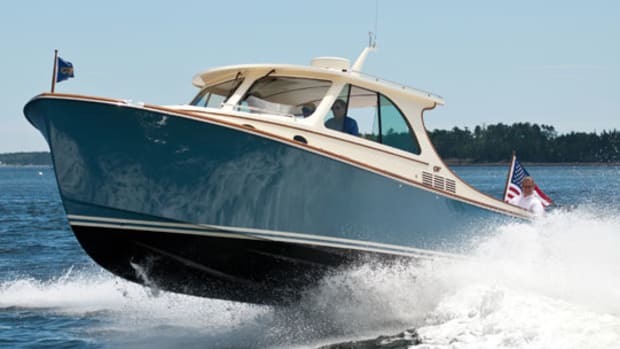 I can sum up my impressions of the Talaria 40 by referring to something McKenney told me during a follow-up conversation about the kind of people who buy this boat. "Owning a boat like this, with its looks and construction, sets its buyer apart from others because it’s that special," he says. 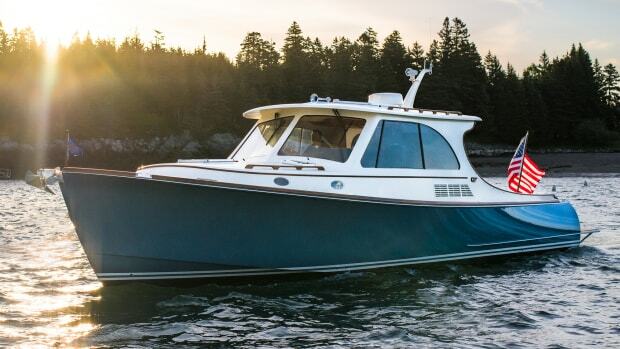 "Having a vessel like the Talaria 40 just makes you feel good."